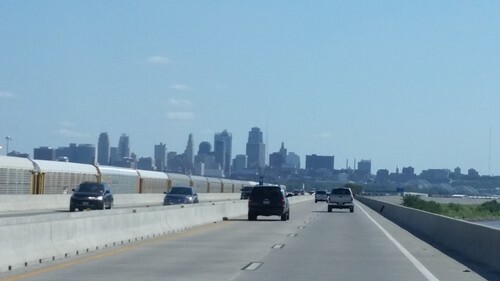 We have made it to Kansas City and have picked up our badges for MidAmericon II, the 2016 World Science Fiction Convention. Today's trip was mostly routine, with a side helping of unwanted misadventures. It was a four state day, which is pretty unusual for us, and only three of the four states were planned. Here's where we were headed, in a picture taken just a few minutes before we arrived around 5 PM. It should have been closer to 2 PM; however, we slept in a little bit this morning, and then we had an unexpected delay when we went out to the minivan to begin packing and discovered that we'd left the electric ice chest plugged in overnight, which had drained the batteries. AAA did come and jump-start the van, and we were able to multi-task by doing load-out while waiting, but it did probably delay us more than an hour, and delays accumulated throughout the day. No time for tourism today. We booked on down I-80 to Lincoln NE, then cut diagonally south of Lincoln (that's the capitol dome on the horizon across the BNSF rail yard) on highway 2 through Nebraska City. We've had more boring drives (I-5 through California's Central Valley being one of them), but also more interesting ones. 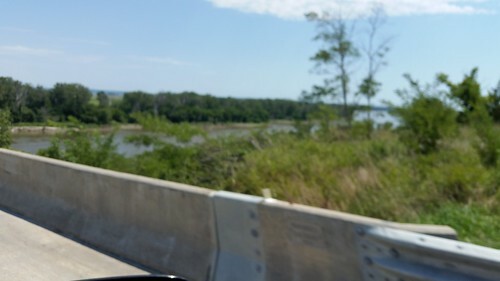 At Nebraska City NE, we crossed over the Missouri River into Iowa briefly, stopping at the Pilot for fuel, then getting onto I-29 for the drive south to Kansas City. Except something wasn't agreeing with me and we had to stop about five or six times for restroom breaks. The minivan also was complaining about driving through the Midwestern humid weather, which was only fair because we were complaining as well. And we're well aware that this isn't too bad compared to what it was like last week. 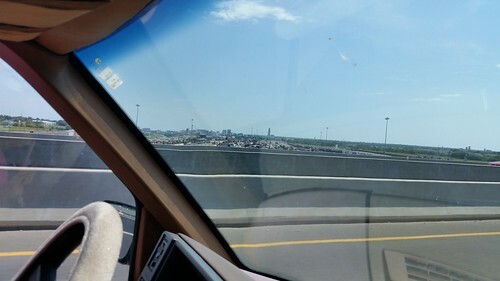 I misread the directions and accidentally sent us on a detour into Kansas, where we had to get off at the first exit and reverse direction, but eventually we made it to the hotel. We unloaded one bell cart worth of stuff, Lisa went inside the hotel to wait for me, and I found my way into the parking garage across the street from the Holiday Inn Aladdin. It took me a while to park as I was trying to figure out where the underground entrance to the hotel was. After joining Lisa in the lobby, we took the cart up to our room and unloaded it, then made two more trips to the minivan to carry more stuff up to the room. Unfortunately, the underground connection includes six steps between the hotel basement and the garage, and thus is not suitable for carts. However, on the bright side, we were able to get what is possibly the closest space in the garage to the underground entrance, and thanks to the geometry of the connections to the convention center, we may be able to use the minivan for "forward storage" of some gear for the Business Meeting. After unpacking most of our stuff for a weeklong stay in the hotel (and bemoaning how small these hotel room are; there are naturally no upgrades available with the heavy occupancy, and this is a downtown boutique hotel, not a suburban one), we headed over to the Convention Center, where registration went routinely (helped by the fact that most of the people working on Registration knew us). I also had two items to deliver: the Ballot Box of Westercon (temporarily re-purposed for NASFiC this year), and an item I had that Exhibits had requested for one of those displays. Fortunately, we ran into Kate Secor of Site Selection and was able to give her the box, and then I popped up to the Exhibits office to deliver the other item. The other things I have are site selection ballots that I am hand-carrying for others, and they can't be delivered until tomorrow. Lisa and I went to Exhibits to see if we could help with setup for the San Jose in 2018 bid. 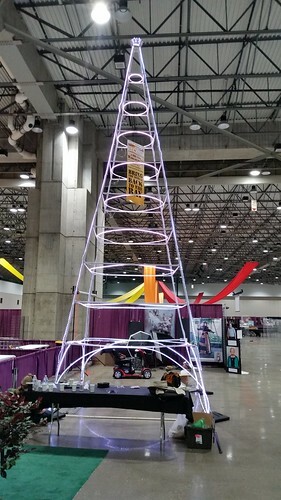 By the time we got there, construction of the San Jose in 2018 Light Tower was nearly complete; however, Lisa was able to help. It turns out that Lisa-my-wife and one of the other women there named Lisa were the only people with Leatherman tools that were necessary to complete the construction. (Bless you, Girl Geniuses!) travelswithkuma, sporting his new steampunk goggles, supervised the latter stages of construction. It's an awesome sight as the tower produces a multi-colored light show evoking the San Jose Electric Light Tower. 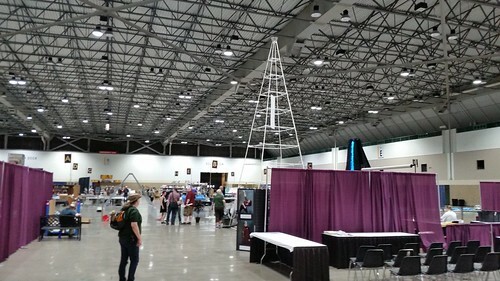 It's impossible to miss, and anchors the SJ in 2018 Worldcon bid display in a spectacular way. kproche admires his creation from inside. It's a great thing. We hope people will use the Light Tower as a meeting point. Initially Lisa and I hoped to get to bed early, but we enjoyed our dinner at BRGR so much that before we knew it it was after 10 PM, we'd missed being able to get to the downtown grocery store before it closed, and we really needed to get back to our hotel to finish unpacking and try to get some sleep. Tomorrow we don't have any early morning commitments (unlike the remaining four days of the convention). We're slightly fortunate in that the Business Meeting is in the function room closest to the hotel, and accessible through the underground walkway. Tomorrow, however, we are not setting the alarm. It's the last time we'll be able to sleep in until Labor Day weekend, I think. Thus ends the 6th day of our Worldcon Road Trip. 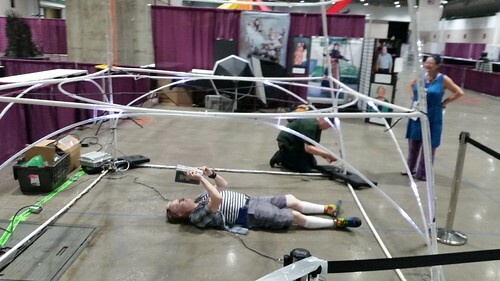 The count now stops while we actually do the Worldcon, and will restart when we leave Kansas City for the drive home next Monday.